Family portraits are simple and straight forward with Carrie McKee Photography. You can choose between studio or location and sessions usually take approx one hour. Studio sessions are only suited to one family so if you require an extended family shoot with unlimited members, there is a £50 additional charge. I require a £99 deposit to secure your date. 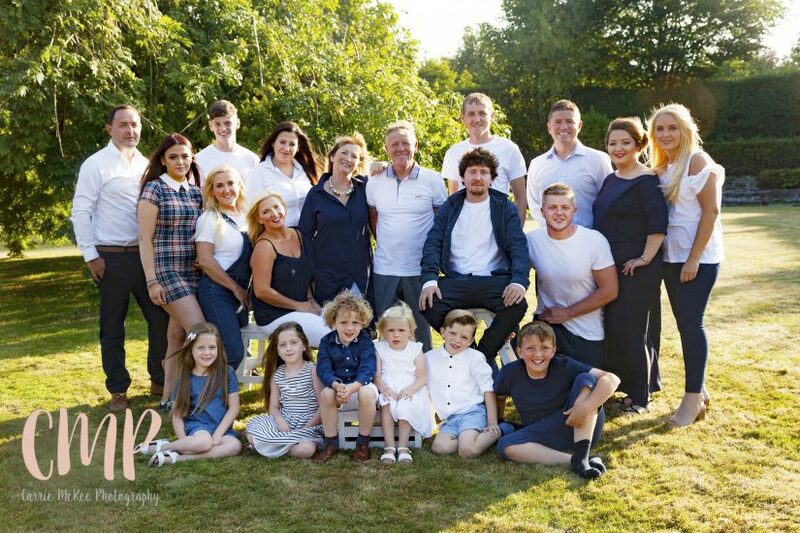 Extended family shoot is a great way to have everyone in the one picture and is every grandmother’s dream to have something like this framed and hung pride of place. Unlimited members in a relaxed and natural setting. Recommended you coordinate outfits accordingly. Carrie McKee. Belfast’s leading Photographer and Printer. Timeless family portraits and newborn details captured in friendly Belfast Studio. Free Parking available. Pick up the phone for a chat and to book your session now. Call now on 07590368295. 507 Crumlin Road. Belfast. Northern Ireland.